In 1897 England, sixteen-year-old Finley Jayne has no one except the “thing” inside her. Only Griffin King sees the magical darkness inside her that says she’s special, says she’s one of them. The orphaned duke takes her in from the gaslit streets against the wishes of his band of misfits. Emily, who has her own special abilities and an unrequited love for Sam, who is part robot; and Jasper, an American cowboy with a shadowy secret. Griffin’s investigating a criminal called The Machinist, the mastermind behind several recent crimes by automatons. Finley thinks she can help-and finally be a part of something, finally fit in. But The Machinist wants to tear Griff’s little company of strays apart, and it isn’t long before trust is tested on all sides. At least Finley knows whose side she’s on, even if it seems no one believes her. 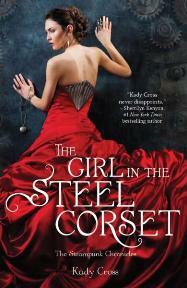 The Girl in the Steel Corset was hard to get into at first, for me. If I used that rule of only giving a book 50 pages before passing the final decision of reading or not reading, I probably wouldn’t have stuck with this book. But I don’t hold to that rule thankfully, because I eventually got really into it and could not put it down. I loved the story itself, especially since this may have been the first steampunk book I’ve read. But it was a little hard for me to imagine some things while reading, like Griffin’s machine for connecting to that other plane, the one where the power comes from. And corsets, but only because I’m not familiar with the fashion of the time. It has piqued my interest though, enough so to do some casual research on corsets. My favorite thing about this book was the romance. Because of the time it’s set it, it’s more likely to be chaste, than I see you and have to jump your bones right now because I’m so filled with lust. I love chaste romance, filled with just looks and innocent touches. There was an interesting love triangle as well, and I found myself siding with the character I’d usually not side with most of the time, which was very interesting. I would definitely recommend this for those wanting to enter into the up and coming Steampunk genre, it’s definitely a good read. Ooh, I’ve had this on my wishlist for a while, but it’s slowly sunk further and further down. Thanks for reminding me, I might have to bump it up! I like your honest review – you’re not the first person that struggled to get into it but ended up loving it. Sounds like even though you had some trouble getting into this one you still enjoyed it ^-^ I’m a bit on the fence but I might just pick this one up! Thanks for the review! !